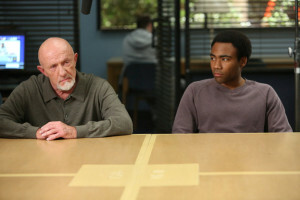 Community: Spoilers & Images For "Basic Intergluteal Numismatics"
The new episode of Community scheduled for this Thursday, January 9, is called “Basic Intergluteal Numismatics” – and we’re sure we spelled something wrong somewhere along the line. A BRAZEN BANDIT INVADES GREENDALE – SURREPTITIOUSLY DROPPING COINS DOWN THE BACKS OF PEOPLE’S PANTS – Everyone is up in arms when an anonymous bandit starts dropping coins down people’s pants. While Dean Pelton (Jim Rash) mobilizes the school to investigate, Jeff (Joel McHale) and Annie (Alison Brie) pursue their own theories – methodically interrogating staff members. When someone eventually confesses, the school heaves a sigh of relief, but Jeff thinks there is more to the story than meets the eye. Gillian Jacobs, Yvette Nicole Brown, Danny Pudi, Donald Glover and Ken Jong also star. 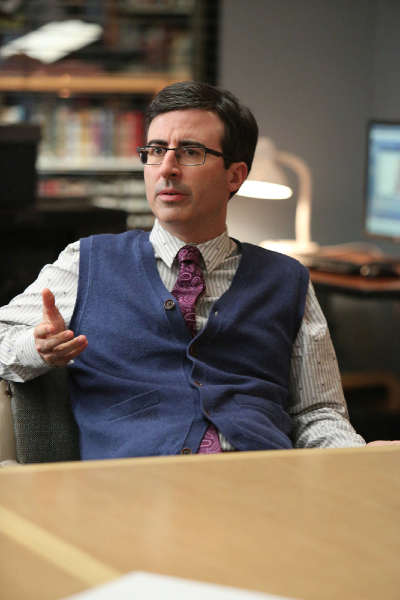 Jonathan Banks and John Oliver guest star.